Please note our bucks are shown in their working clothes. All breeding stock is sold registered with Pedigree International (PI) and/or the American Savanna Registry (ASR) unless otherwise noted. Stock is current with vaccines, worming and hoof trim. Delivery is available. A $100 deposit is required to reserve or hold a Savanna buck, of which $50 is non-refundable. 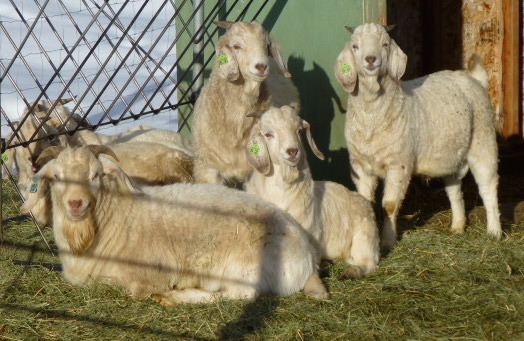 If you decide not to take that specific goat, your deposit less $50 will be refunded to you. That $50 can be applied towards the purchase of another goat.﻿ If we cannot meet your needs, your entire deposit will be refunded in full. Once your deposit has been received, please make plans to pick up your animal(s) within 30 days. A fee of $1.00 per day will be charged after 30 days of receipt of buyer's deposit. All prices shown are at weaning. Bucklings must be picked up within 30 days of receiving deposit. Proven buck! This is our current Savanna herdsire and we are very pleased with his kid crops. He is 2-1/2 years old. Because we are retaining one of his bucklings, is time for him to move to another ranch where he can continue to produce great kids! This buck has a good disposition...is a bit standoff-ish and not agressive...just they way you want them. This 2016 buck displays light gray/red roaning, has 100% black pigmentation and will be sold registered with Pedigree International. He is ready to work! Very nice buck with good temperament. This is a great opportunity to purchase an affordable fullblood Savanna buckling. Because the Savanna breed was created from indiginous South African breeds, a small percent of kids may be born with color. This is a very nice herd sire-quality buckling that will be available late May after weaning. DNA for sire and dam will be on file soon. He is being offered as commercial.﻿ This buckling is very friendly and will be easy to work with. Here is a great example of hybrid vigor! This muscular buckling is showing great promise as a future herd sire prospect. Uniquely colored, this blue roan paint buckling is a twin born 2/18/2016. His sire is our wide-framed paint ABGA Boer buck JAFC BARLAS BOER GOATS EVENT HORIZON (ABGA 10597726). Dam is a registered, fullblood Savanna doe. His pedigree includes Powell/Holman stock, SWE Main Event and NK Sneak Attack. Savanna genetics include Dale Coody stock and Beckstead Farms. If you're looking to add Savanna genetics and hybrid vigor to your meat goat herd, this buck's for you! Easy temperament, from a clean healthy herd. We are very impressed with this bucklings development! This dam-raised triplet is well-muscled with very good bone and beautiful top line! If you are looking to add Savanna breed influence into your herd, but not interested in fullblood registered stock, this buck may fit your needs. His sire is 100% Savanna and his dam is 100% Boer. He is a perfect example of hybrid vigor. You will not be disappointed. This 2016 buck displays light gray roaning, has 100% black pigmentation and will be sold registered with Pedigree International. He is ready to work!